Ever wonder what it'd be like to fly over Cydonia? To soar over the Face up-close, zoom the D+M, dive on the City Pyramid, "Last Jedi" and other monuments; to see what the fuss has been about for decades? Although we can't quite do that in person yet, we can do the next best thing, which is flying through the mapped HiRise images. Here's what happens when we lay all the available Cydonia HiRise high resolution photos (most of which I personally targeted for acquisition) onto the elevation map of Mars- and then fly your jet through it sighseeing. I think you'll like it, show me with an upvote.. Caution: There is a certain wow factor involved. Backing tracks chosen carefully for impact, but if they're not your thing mute and fly in silence. 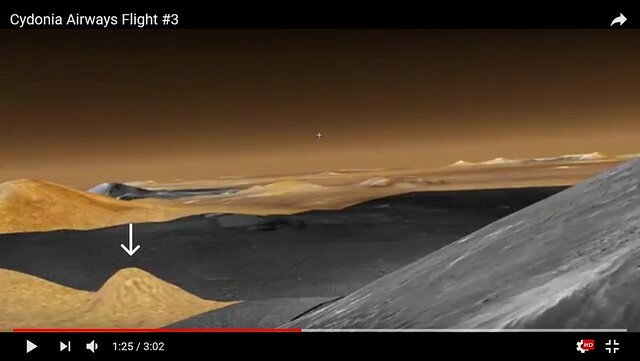 I love it, I would love a different kind of music like the sounds from that comet that we heard way back or some acustic music (electro acustic) hopefully when NASA sends those drones/helicopters we may see this in real color (I doub it). I remember Mark J. Carlotto's primative versions and DJ Barney did a similar overview. Thanx Kieth, make sure you folks get ALL seven videos !!! The Deya Dova soundtrack on number six added a very special enchantment to the awesome flight. That must have been a lot of work to make those videos. Some of the flight paths are stunning and spectacular. but the video flights were all great. I chose a Martian Winter and an Erisian Autumn quite on purpose. AND Paloma Faith Never tear us apart.. these were all chosen for a reason. and Paloma doing 'Never tear us apart" channels that time when worlds smashed and it was all broken, who we really are and why we're still here. While watching these vids, be paying attention to the scenery below... There are levels of art and land sculpture below that can really only be seen by projecting the images in this manner. I've discovered several new features that would be fairly unnoticeable looking straight down. These martians carved their visages, totems and 'gods' on nearly EVERYTHING. The Face IS a Face. and though they're major, and more than we could even imagine... there's even more. Expulsion Mound is a giant artwork. there's so much more to be seen now. and those are just my first vids... they'll get much better as I climb the learning curve. This is a feature article at Onstellar, which is like the new better FB for folks that like the topics we do but don't like being sold and treated like a commodity. join up, use my username keithlaney as a referral and get some free tokens. This screen-capture is the first evidence eye have that sum-one else shows this anomaly on-screen! I never truly knew if this was on anyone else's radar screen. Quote: Friday, June 1st, 2018, 12:29 pm (This post was last modified: Friday, June 1st, 2018, 12:34 pm by Keith.) While watching these vids, be paying attention to the scenery below... There are levels of art and land sculpture below that can really only be seen by projecting the images in this manner. yeah, the mola data does seem to indicate a sharp small hill there. if there were photo data covering that area we'd see it in relief. kind of strange though, i know that area seems to be amorphous to the rest of the pimply plain it sits on. and then it popped right out to be quite visible. but it's there and quite prominent. It would have to be an artificial construct in consideration of everything else present nearby, IMO. The two video's are absolutely spectacular viewing. (06-06-2018, 09:39 AM)Keith Wrote: yeah, the mola data does seem to indicate a sharp small hill there. if there were photo data covering that area we'd see it in relief. kind of strange though, i know that area seems to be amorphous to the rest of the pimply plain it sits on. Do you know where to get the MOLA data for the entire CAAIM ??? By itself, or with images in a format use for Poser or Bryce? I don't have access to any other 3D software to use, but I have an 8 core processor that does rendering faster than a Quad. If you'd like we can continue discussion here: #234 T.R.E.V.O.R. B.U.G.S and Cydonian Arcologies. I will import our quotes to that thread. From the apex of Mt. Serendipity to the centerline vertical axis on the base of the face itza ~19.471 km @ 23.5 deg. That is our axial tilt. At exactly the 9:00 (nine minute) mark you can see Eye/I set a compass on the mount. I also set a templar cross for effect. Quote: Keith Wrote: yeah, the mola data does seem to indicate a sharp small hill there. if there were photo data covering that area we'd see it in relief. kind of strange though, i know that area seems to be amorphous to the rest of the pimply plain it sits on. I don't wish to belabor this thread when Mt.Serendipity has itz own subject matter discussed here. #234 T.R.E.V.O.R. B.U.G.S and Cydonian Arcologies. You are a steady pilot and totally get the hang of flying the flight simulator in google! 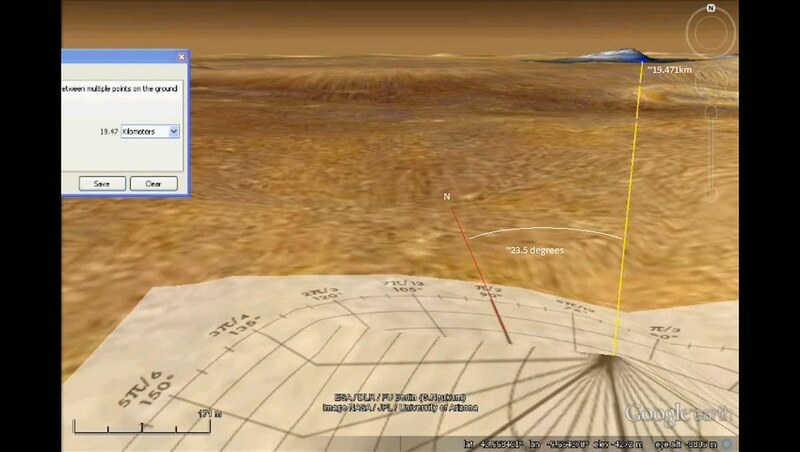 you'll run into big problems using Gmars for measuring distance. I've found them to be CONSIDERABLY and consistently off. Well done, maestro! All the vids are great. For an instant, I thought the music to #7 was going to be that famous Steppenwolf song . . . I liked the music from #6 the best (Arabic/Middle Eastern flavor). Current time: 04-22-2019, 04:59 AM Powered By MyBB, © 2002-2019 MyBB Group.